Orchids are thriving, thanks to the dry, warm spring this year. 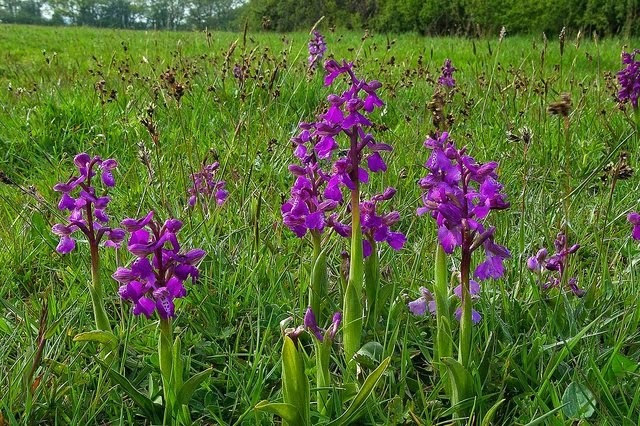 Among the many to be found is an exceptional display of scarce orchids at a Norfolk Wildlife Trust nature reserve in south Norfolk. This year's count of green-winged orchids at NWT New Buckenham Common was a record-breaking 2,300, the highest since 2002 and about 1,000 up on previous years. One of the most sizeable areas of common land in South Norfolk, NWT New Buckenham Common’s history can be traced back to the 12th century. Norfolk Wildlife Trust has cleared scrub on the site, a boost to this beautiful species. Worth a visit - but keep any dogs on a lead. PS Pure fluke, but I've been using the fascinating online etymological dictionary to research another book (Machiavelli's Acolyte, a 17th-century murder mystery), and tripped over the this quirky little fact. The Oxford English Dictionary apparently has a listing for the green-winged orchid, the old name of which was ... 'Fool's ballocks'.